Home » Archive by category "Soups and Stews"
This succulent chicken dish is made with our present bounty of peaches and zucchini. Once the chicken is stewed with these ingredients, it is sweet and perfect with rice and/or green salad. These sides balance the luscious flavors of the stew. Enjoy! 1. In an 8-quart saucepot, heat the oil. 2. When oil is hot, add the chicken pieces and brown them on all sides on medium-high heat. 3. When chicken has browned, stir in the onions; cook onions 2 minutes or until they are translucent. 4. Add the wine and cook chicken, on medium-high heat (uncovered) for 7 to 8 minutes or until wine has thickened. Stir occasionally. 5. After wine has thickened and slightly reduced, add 1-1/2 cups water, the cumin, black pepper and 1 tablespoon honey. 6. Cook chicken 14 to 15 minutes on medium-high heat until liquid has thickened. 7. After 14 to 15 minutes, stir in remaining ½ cup water, peaches & . 8. Cook chicken on medium-high heat, covered, for 10 minutes; stir occasionally. 9. After 10 minutes, add the zucchini rings and cook 2 minutes or until zucchini is crunchy-tender. 10. Taste the stew. Adjust seasonings and honey, to taste. 11. Transfer chicken to serving platter, garnish with mint sprigs; serve immediately. 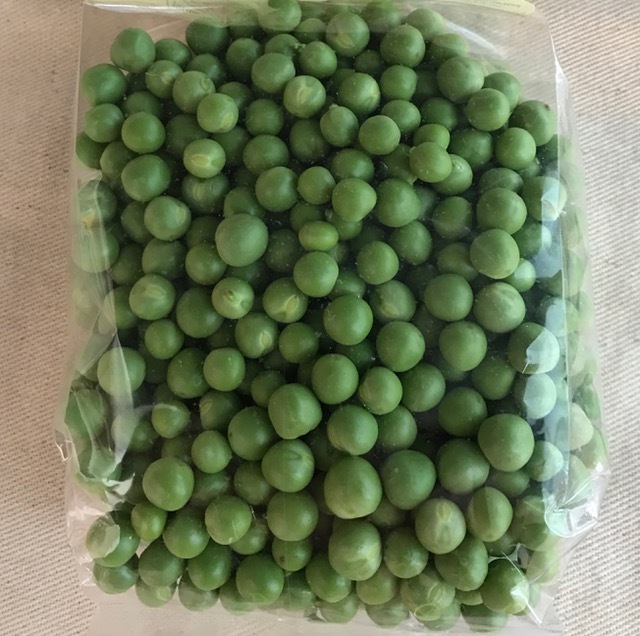 I hope you weren’t thinking of using canned or frozen peas to make a great-tasting pea soup. With fresh peas and a few more ingredients, you’ll enjoy a great meal in no time. Complement this gourmet soup with rustic French or Italian bread and your favorite wine. Bon appetit! 1. In a 4-quart sauce pot, heat the oil (it should not smoke). 2. 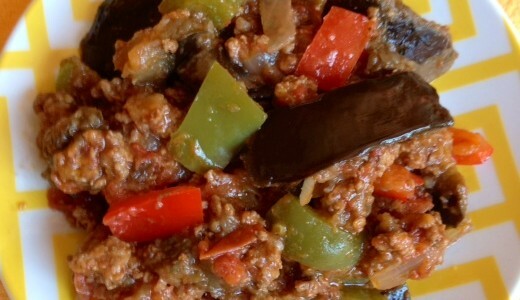 When oil is hot, add the chopped onion; stir-fry onion with wooden spoon until it is translucent – about 2 minutes. 3. When onion is translucent, pour in 2 cups of the water and stir in the peas. 4. Bring the soup to a boil. 5. When the soup comes to a boil, add salt, black pepper and nutmeg. 6. Cook the soup on medium-high, making sure it boils, for about 5 minutes. 7. After 5 minutes, add 1 cube vegetable or chicken bouillon; set heat on medium to medium-low and simmer the soup for about 10 minutes or until peas are tender. 8. When peas are tender, taste the soup. If another bouillon cube is needed, you may add it at this point. 9. Set the sauce pot with soup aside on a cold burner. 1. When soup is lukewarm, transfer one-third of it to a blender. 2. Add cream to soup in blender; blend soup until smooth or slightly lumpy-smooth, per taste. 3. Transfer this first batch of soup to a large glass or porcelain bowl; repeat blending the remaining soup in two more batches. 4. Transfer the last two batches to bowl. 5. Return the blended soup to the sauce pot; bring to a boil. 6. When soup boils, stir in the sliced carrots and cook for 2 minutes. 7. Serve soup immediately; garnish with fresh mint leaf sprig. Here’s a delicious soup that’ll keep you warm in the next few months. 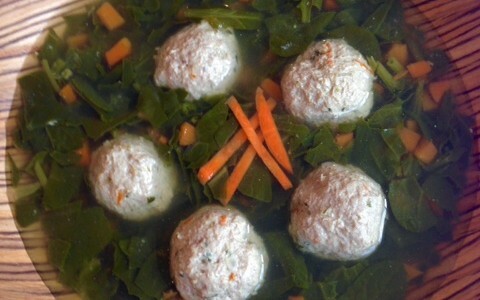 This meatball and spinach soup is made with ground turkey but you can use beef, lamb or pork. Fresh spinach and some carrots are added to the broth – this makes it low-cal and healthy. 1. In a large, glass or porcelain bowl, combine the ground meat, onion, egg, 3 tablespoons of the minced carrots, parsley, salt and nutmeg. 2. Mix with a fork or with your hands (you can use plastic cooks’ gloves to mix with hands) until mixture is uniform. 3. Shape and form meatballs to measure 1-1/2-inches in diameter; set the meatballs aside on a large platter. 4. Meanwhile, in an 8-quart sauce pot, bring the chicken broth to a boil. 5. When the broth boils, gently drop the meatballs into the broth, taking care to avoid hot splatters. 6. Bring the meatballs to a boil and cook them on medium-high heat for approximately 20 minutes. 7. After 20 minutes, cut into one meatball to check doneness. If meat is still pink, cook the meatballs for an additional 5 to 7 minutes. 8. When meatballs are cooked through, add the spinach and carrot pieces to the soup. 9. Cook the soup for an additional 4 to 5 minutes or until the carrots are crunchy-tender. 10. Taste the broth. If needed, add salt, to taste. 11. Serve the soup with your favorite bread. Make this Basic Chicken and Vegetable Soup in no time. It’s so easy and also tastes better than any readymade soup from a restaurant. All you need is one chicken, carrots, zucchini, potatoes and seasonings. When the soup is done, you won’t have to cook for the next three days. 1. Place chicken, bay leaves and onion in an 8-quart saucepot. Cover chicken completely with cold water. 2. Set sauce pot with chicken and water, covered, on a stove burner and bring to boil. 3. Meanwhile, cut the zucchini into 1-inch circles and transfer them to a 6-quart bowl filled with cold water. 4. Cut the carrots into 1-inch pieces and transfer them to the bowl with zucchini. 5. Peel the potatoes and cut them into 1-inch chunks. Transfer potatoes to the bowl with zucchini and carrots; set aside. 6. When chicken soup boils, remove cover and add bouillon cube. 7. Cook on medium-high for about 45 minutes to one hour or until chicken is done. 8. After 45 minutes, test doneness of chicken by cutting into the thickest part of the breast meat with a fork and knife. 9. If the meat is completely white, it is done. If it is still pink, cook chicken 10 to 15 minutes longer. 10. When chicken is done, using thongs and an extra large fork or spoon, transfer the chicken to a large glass or porcelain bowl or platter. Set aside to cool. 11. Meanwhile, strain the broth into an 8-quart bowl. Return the broth to the sauce pot. 12. Bring the broth to a boil. When broth boils, add the zucchini, carrot and potato chunks. 13. Boil for about 5 minutes or until vegetables are crunchy-tender (test by inserting a fork in potato). If needed, cook for an additional 3 to 4 minutes. 14. Meanwhile, as soon as the chicken is cool enough to handle, remove the meat from the bones. Discard the bones. 15. Tear the chicken into bite-size pieces. 16. Add the chicken pieces to the soup and heat through. 17. Taste the soup and, if needed, adjust the salt level. Serve immediately with fresh bread.